Similar to a previous post I wrote on How To Configure Remote Desktop to Hyper-V Guest Virtual Machine I commonly get questions for “how do I access Hyper-V host machine files from inside a guest virtual machine?” The solution I use is a combination of software and configuration but there are many other options as well. When connecting to a Hyper-V guest virtual machine you cannot easily transfer files into or out of the virtual machine. For almost all of my remote desktop needs I use a program called mRemote (Multi Remote). The original mRemote developer has joined a new company and folded mRemote into a new product but you can still download a stable build of mRemote from CNET here. There is also a forked version called mRemoteNG (Multi Remote Next Generation) that I have not tried out personally. One of the nice features of mRemote is that you can configure an RDP connection to map local host drives so that they are available inside the RDP session. By RDP’ing to a virtual machine with the host drives mapped you now have access to transfer files into or out of the virtual machine. Open mRemote and configure your RDP session as normal. Under the Redirect heading change the Disk Drives setting to Yes as in the screenshot below. As an added bonus mRemote also allows you to store credentials to use for an RDP connection. I find this very helpful to avoid having to retype credentials every time I bring up a virtual machine, especially with how many fake demo domains I deal with in various virtual machine farms I build out. 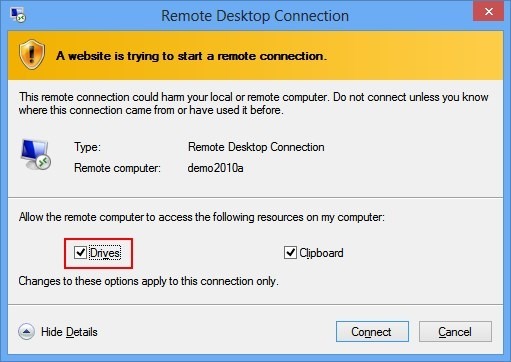 When you connect to this RDP session you may be prompted to allow the remote desktop connection to access local resources (I do on Windows 8 at least, I didn’t previously on Windows 7). Make sure to allow the Drives resources to be accessed. If anyone knows a way around this prompt I would be interested to hear as I have not found any yet. After connecting to the virtual machine you now have access to the host machine drives. See the example below. As I stated earlier there are a number of ways you can solve the issue of not being able to access host machine files inside a Hyper-V guest virtual machine. My solution is a combination of RDP session with the mRemote application and configuring the RDP connection to map local host drives into the RDP session. If you have other solutions or tips feel free to leave them in the comments below.